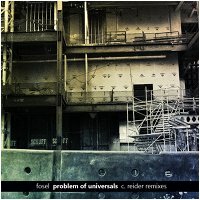 Experimental ambient alchemist Kurt Nimmo returns to Earth Mantra with an invigorating new Fosel release entitled Problem of Universals (C. Reider Remixes). Unlike Fosel's previous Earth Mantra release Couriers of the Air, this new album presents a collection of remixes of original pieces composed by C. Reider, off of his 2009 release Electret Quintet, itself a study of analog drum machines and their use in experimental electronic music. Where the Electret Quintet music pulses with the energy of experimental IDM, Problem of Universals instead conveys a more subdued vibe, packaged in a gritty and yet quite beautiful collection of electronica that explores ambience as thoroughly as it exudes the avant garde. The music of this album simply fascinates. At first, the glitchy veneer suggests an air of almost ominous experimentalism. But in peeling back the layers, we expose a delightful heart of dreamy ambience, a delicious counterpoint to the more exotic outer shell. No doubt this originates in the dual influences of the two artists whose music went into this album, but the fusion of the two styles dovetails elegantly. Folks who enjoy the more experimental or noisy side of music will feel right at home with this release. But likewise, Problem of Universals will appeal equally to lovers of old school ambience who want their music a bit more approachable. Quite a clever balance Fosel strikes - very well done indeed. In particular, we are struck by the diversity of the music in this album. Some pieces meander slowly through the sounds, inviting the listener to drift alongside. Others throb rhythmically amid subtle washes of sound, getting the blood pumping again. Still others wander through a desolate landscape of electroacoustic imagery that somehow still evokes a sense of melancholic charm. Literally something for everyone to be found in Problem of Universals. So it is with great pride that we unveil the latest release from Kurt Nimmo, another example of his particular genius with the art of sound composition. Highly recommended to all of our listeners. I am honored by Fosel's incredible remixes! He's done some terrific work here. Darned good. Nice spacious stuff, kind of tweaked in a cool way. Well worth checking out.